Hon. 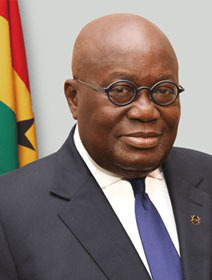 Nana Addo Dankwa Akufo-Addo became the fifth President of the fourth Republic and the 13th President of the Republic of Ghana after winning the country’s Presidential Election 2016. On 7 January 2017, he took charge as the President of Ghana, by virtue of which he is an ex-officio Chairperson of COMSATS. The Chairpersonship of COMSATS was rotated in 2012 from Pakistan to Ghana through consensus among the members of COMSATS’ Commission at its 2nd General Meetings held in Islamabad. The Commission decided to retain the Chair with Ghana for yet another set of three year at its Accra Meeting held in 2015. President Akufo-Addo was born and raised in Accra Central. His father was among the founding fathers of Ghana’s independence struggle, and remained: Ghana’s third Chief Justice from 1966 to 1970, Chairman of the 1967-68 Constitutional Commission and the non-executive President of Ghana from 1970 till 1972. Mr. Akufo-Addo received his early education in his native city and went to England for his O- and A-Level studies at Lancing College, Sussex, UK. In 1962, he returned to Ghana and studied at the University of Ghana, Legon, earning a B.Sc. (Economics) degree in 1967. Subsequently, he studied law in the UK and was called to the English Bar (Middle Temple) in July 1971. Mr. Akufo-Addo was called to the Ghana bar in July 1975. He rendered legal services for the chambers of U.V. Campbell from 1975 to 1979, and in 1979 co-founded the law firm ‘Akufo-Addo, Prempeh & Co.’, which has become one of the prominent law firms in Ghana. Mr. Akufo-Addo used his law practice to champion the cause of human rights, rule of law, justice, freedom, and democracy. He was well-known for giving free legal assistance to the poor and fought for the rights and liberties of the Ghanaian people. In 1992, he was the first national organizer of the New Patriotic Party (NPP) and, later that year, campaign manager of the party’s first presidential candidate, Prof. Albert Adu Boahen. Between 1996 and 2008, Mr. Akufo-Addo was elected three times as Member of Parliament for the Abuakwa South constituency in the Eastern region of Ghana. From 2001 to 2007, he served in the Government of President John Kufuor – the second President of the Fourth Republic as Cabinet Minister, first as Attorney-General and Minister for Justice for two years, and later as Foreign Minister for five years,. Mr. Akufo-Addo is married and has five daughters.